This is the Iconic Filipina super-heroine created by Mars Ravelo. I focused on the modern origins of Darna using the 2003 Mango Comics 3-Issue series as a primary and scenes available from the 2005 GMA TV series from utube.com to help flesh it out. This TV series uses the same origin as the comic (and expands on it) and it was necessary to fill in the gaps left by the all too short comic series. Any powers used exclusively in the TV series are indicated in parenthesis as are any power levels that may seem to be demonstrated at a higher level in the TV series than demonstrated in the comic. The comic obviously is trying to make the character more accessible internationally by being written in English, and yet assumes a certain familiarity with the character. Thus, not many of her powers are actively demonstrated (except where they wanted to adapt or add something to the character). Any powers added from the series would likely appear in the comic if it had a longer run. I also made notes about some of the alternate versions and the main differences between those versions including equipment usage. Please also note that while I did a lot of research for this write-up, I am not Filipino and do not speak Tagalog. Thus, my knowledge is limited to the few English versions of Darna and the many secondary sources and web sites (which are sometimes contradictory). In the GMA TV Series: Valentina (cousin), Tatay Mulong (Nosformos, father, deceased and resurrected), Nanay Ising (mother, deceased), Prospera (aunt), Iking (adopted brother). Group Affiliation: Filipino Superhero community. Base Of Operations: Manila, Philippines. 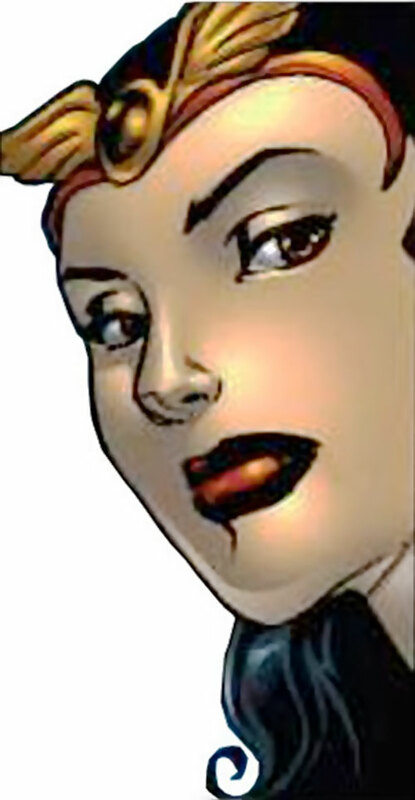 According to the writers of the modern version, her strength and flight (and many of her other powers) are enhanced by or stem from her psionic abilities, including telekinesis. She also possesses psionic influence over others, which she calls “Parahypnosis.” She can remove memories (though doing so causes severe headaches) and can influence others. She often removes the immediate memories of those who witness her transform. She uses her influence to cause people to listen to her and subtly influence their decisions with her persuasive personality. She is likely broadcasting her hypnosis constantly to give her a shift on the interaction table and to suggest that any resemblance between Narda and Darna is coincidental. The most common use of her telepathy is to communicate with her host, Narda. They also use it to commune with “The Matriarchs” who are the leaders of her people and likely powerful telepaths in their own right. 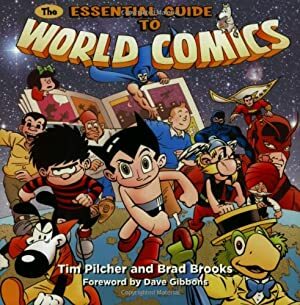 Any powers not shown in the comic are indicated in parenthesis as are any power levels that may seem to be demonstrated at a higher level in the TV series than demonstrated in the comic. Her Heat Vision may actually come from a gadget (see below). Darna is a classic comic book character every bit as iconic as Superman in the Philippines. She became one of the first Super heroines in film in 1951 when she was played by Rosa del Rosario. She has inspired 14 movies along with countless shows, magazines, spoofs and spin-offs. She’s even been the subject of one ballet performed by Ballet Philippines (the national dance troupe). Her origin and other aspects about her have been reinvented numerous times, but some aspects always remain the same. She is always the girl Narda who has swallowed a magic white stone and when she shouts, “Darna!” turns into the “relentless crime fighter who uses her extraordinary abilities of flight and superhuman strength to help in big ways and small ways. Someone who does not tolerate injustice. In any form.” She is truly the icon of Truth, Justice and the Filipino way. This section is from Internationalhero.co.uk . “When young Narda witnessed a falling star late one night and went to investigate where it landed, she found a strange little stone (revealed to be from the planet Marte, and containing the mystical essence of the Andranika inhabitants of same) with the word ‘Darna’ written on it. Hearing others approaching, she popped it in her mouth and in a moment of impetuousness, swallowed it. Instantly, she was overtaken by the sensation of traveling through space, and collapsed. She was found by her guardian, her grandmother [and her younger brother, Ding], who took her home and put her to bed. Later she asked Narda what had happened, and the young girl recounted the story of her find. But when she said the word that had been inscribed on the stone, she was instantly transformed in a flash of lightning into a tall, Amazonian woman. This was Darna, a mighty warrior of Marte, named after the mythological Adarna bird. Narda was channeling the alien woman. Luckily Darna meant no harm and by saying Narda, she was able to change back. NOTE: The Adarna Bird is a mythological creature of Filipino mythology. Much like the grail myth, a King asks his sons to retrieve the bird when he is mortally ill since he is told only the curative properties of the bird’s song can save him. The versions of Darna can be separated into 3 distinct periods. This is the original Darna. In this version, Darna’s powers are magical in nature and Darna is likely extra-dimensional in addition to being extraterrestrial. 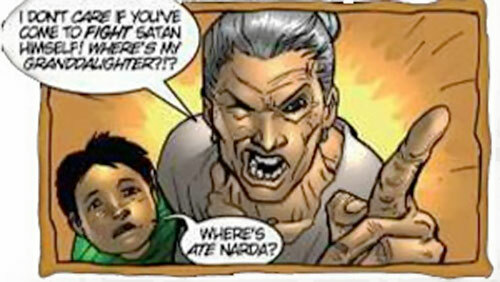 In this version, Narda is a separate entity from Darna, a little girl who transforms into an alien woman. Also, once she swallows the stone, it is a part of her and all she has to do to transform is shout Darna’s name. From what strips I’ve seen of Darna in this age, she seems very similar to a Golden Age Superman or Captain Marvel with very pulpy enemies. It is this version that first appears in the movies (carrying her sidekick/brother on her back). The list of villains from these movies could just as easily appear in the Flash Gordon serials (including Hawk people) as a Darna comic. The snake queen Valentina appears this early and remains Darna’s nemesis in every incarnation. Valentina seems based on both the Greek gorgon, Medusa and the Asian myths of Naga. Equipment – While she has the skullcap tiara, bracers and disk covered belt from her creation, all of her powers were internalized with this version. If you are trying to emulate a more ‘classic’ Darna, her Flight and Invulnerability should be internalized rather than be a part of her Tiara. She may or may not even have the Power Reserve boosting her abilities, but if not, she should likely have a higher Body, perhaps 16. This is primarily seen in movies and has many variations to the other versions. 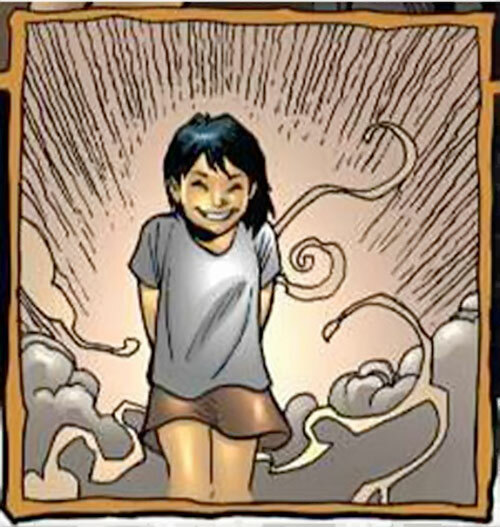 For one, whenever she transforms back into Narda (a teen in this version), the stone reappears in her mouth and she must swallow it again in order to transform into Darna (which is just an idealized version of Narda, not an alien entity). One of the most significant differences of this age is the origins of the stone and the types of opponents she faces. The stone is said to come from an angel and her super-powered opponents are even more mystical in nature, including Filipino legendary creatures that basically equate to vampires, werewolves and zombies. This version could have a higher Occultist by a couple of APs. Valentina also appears here, often disguised as a model or religious leader (of course of a cult of victims who don’t realize what they’re serving). She can shape shift into a snake and usually has demonic henchmen (who also can transform into snakes). Added Equpment — The Viva films of the 90s have Darna deflecting bullets with her bracelets (despite the fact she is bullet-proof) as well using her tiara as a thrown weapon. These are the most “Wonder Woman inspired” aspects ever tied to Darna (and they seem to be almost exclusive to this version). Here, Darna returns her to her Goden Age origins with a few modern twists. Again, she is from another planet (and perhaps dimension), Nibiru (also known as Marte). Darna’s powers are said to be psionic in nature. This is the version defined in the 2003 Mango Comics 3-issue series and picked up and continued in the 2005 GMA TV series. In this version, Narda acquired the stone (and swallowed it) while a girl, but is now in college studying medicine. She does not cough up the stone (in the comic) and Darna is again a separate entity, though the two seem to be aware of the other’s actions and can communicate telepathically. The background origins of Darna’s race of “Adarna Warriors” (again, named for the Adarna bird of Filipino legend) and Valentina’s race of “Serpent Queens” (still resembling Medusa and/or Naga) is revealed in this version. The two races shared the planet of Tiamat and became embroiled in a fierce war which ravaged the planet. The Adarna Warriors then sought a new planet, Nibiru (also known as Marte possibly to consolidate earlier retcons ). In this version, Valentina can entrance her victims to become her willing slaves. She also uses snakes and their venom to increase her slaves’ physical prowess, particularly strength. Similar to previous versions, she has a pair of accomplices in the comic (China and Ebony) who in this case are also Snake Queens from Tiamat. Added equipment — According to the writers of the comic, her psionic abilities are boosted by her tiara and according to Valentina, seems to be the source of her indestructibility and her flight. As stated above, the origins of Darna’s people are revealed in the Mango comic series. According to The Matriarchs, Darna was their greatest warrior. She was their greatest hero and champion but fell in battle. Rather than accept her loss, The Matriarchs used powerful magic to take her essence and distill it into a stone. The stone was The White Stone that sought a soul as pure and as valiant as Darna’s. It sought out Narda on Earth and this is why Narda was the one who saw the star fall from the heavens. Darna, using Narda as a vessel, became a champion of ‘The Light’ on Earth. For many years she fought crime and injustice. Even as Narda left the “Village of M” and moved to Manila to attend medical school at Mabuhay University (a fictional University based on the University of the Philippines ). She maintained her duel identity. One day she encountered terrorists who had taken hostages. The police negotiations had failed and the situation was starting to escalate. Naturally, Darna intervened and captured the terrorists, but noticed in doing so that they were much stronger than normal humans. At the same time, she was asked by some local officials to investigate some mysterious deaths at nearby Tagaytay. The bodies found were horribly disfigured and had a large amount of venom in their system. Darna found a snakeskin that would belong to a snake the size of a large tree. With these events still in mind, Darna assumed Narda’s form to attend a concert by the huge star, Amor. Through a series of events, Darna discovers that Amor is tied to the bodies and the ‘enhanced’ terrorists. She also soon realizes that Amor knows her identity as well. It is only when the terrorists are killed in their cells by a horde of snakes and one scrawls a final warning on a scrap that reveals the truth: Amor is secretly the Serpent Queen, Valentina! She has enchanted the men to be her slaves. Darna flies to Amor’s next concert to discover that she has taken Narda’s friends hostage and that she has two other gorgonic henchmen. She fights the henchmen but Valentina poisons her hostages and escapes. Darna rushes the two to the hospital, and Narda questions her mission. After communing with The Matriarchs; Narda and Darna unify more fully, becoming ‘one’. They seek out Valentina at her secret temple and have a final battle. In the course of the battle, Darna is thrown through the columns supporting the temple, causing it to fall in on Valentina. While Darna tries to save her, she finds the collar she grabbed to pull Valentina out as the temple collapsed upon them has come off and is empty. Darna is often called “The Filipina Wonder Woman,” and many might consider her a copy of Wonder Woman. She is actually far more inspired by Superman and Captain Marvel. It’s important to note that especially when both characters were created, just about the only super power they had in common was Super Strength. Darna has always been able to fly, possessed superior strength and speed. These were not uncommon powers amongst Golden Age heroes. It wasn’t until the 1987 update to Wonder Woman that Diana gained many of the powers that make them look similar on the surface. Originally, Wonder Woman could not fly, nor possessed any special speed. In this way is can be said that Wonder Woman might be more inspired by Darna than the other way around. 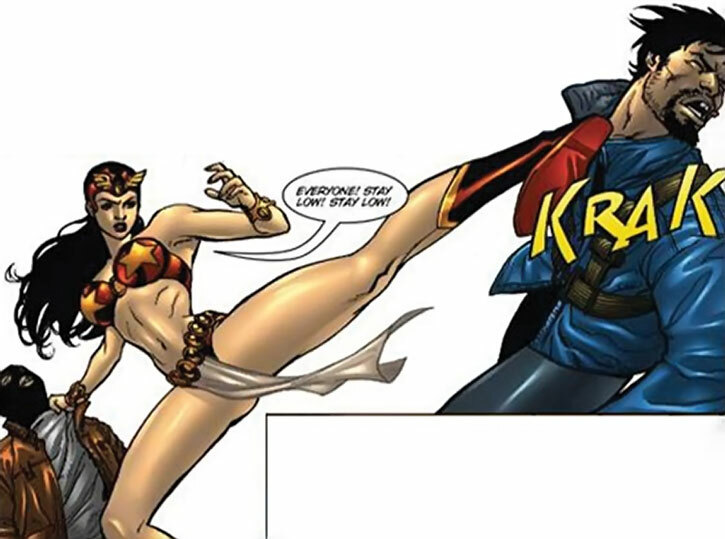 There is one variant of Darna that does seem to be directly inspired by Wonder Woman, however. The Viva films versions of Darna used her bracelets to reflect bullets (since bullets might not harm but would sting her). She also reportedly used her Tiara as a throwing weapon. Both of these tactics are associated with Wonder Woman. I’ve also heard it said that their costumes are somewhat similar. There are similarities, including the tiara, bracers and boots. They both wear revealing ‘swimsuit’ inspired outfits. However these elements are about as common amongst golden age heroes as capes. Also, when both heroes were created, Wonder Woman was mostly reliant on her costume and equipment (her plane, lasso, tiara, bracelets, etc.) while Darna’s powers were purely internalized. Interestingly, Wonder Woman has grown less reliant on equipment over the years where Darna has grown more so. In short the resemblance may be a little more than passing, but they are different characters with a similar source of inspiration. They are both created as strong female heroines. Mars Ravelo was the son of a strong single mother and it is said Darna was created based on her, with Ding based on Mars as a boy. While Wonder Woman was designed to be a ’strong female role-model,‘ Darna was inspired and based on a real-world ’strong female role-model‘ that had some of the same traits. In all but the most recent versions, Narda’s brother Ding also acted as Darna’s sidekick. He is the classic kid brother sidekick who gets captured often but displays deadly accuracy with his slingshot. Darna is a classic hero. Much like Superman, she is a true example of someone seeking to defend the weak and whose values can seem somewhat naïve at times; particularly in the face of the corruption the Philippines’ legal system. Like many Golden/Silver Age heroes she has an almost constant internal monologue (though in earlier versions she shared these dialogues with Ding). She is very outspoken to help the people who can’t help themselves: the weak, poor and downtrodden masses. 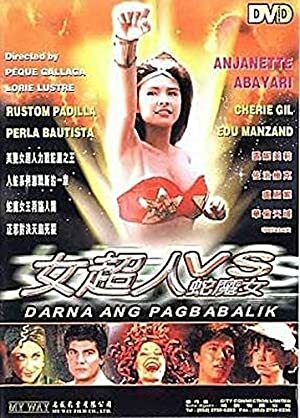 One interesting thing about Darna is the telenovela aspects of her subplots (especially in the live-action versions). As in Mexico and other countries with Spanish influence, telenovelas are very popular in the Philippines and the GMA series could be descried as one. Narda usually has a love triangle going and usually at least one of her suitors is torn between his interest in Narda and Darna (of course not realizing they share a body). Darna is prone to making righteous speeches and expecting to be taken seriously. With her beauty, powerful personality and mental capabilities, she almost always is. She’s a shining example of someone who fights for those who no one else will. You could easily use Darna as is. South East Asia is sparsely populated in the DCU and it would certainly be protected by Darna. Any of the heroes who travel to SE Asia, especially the Philippines, might encounter her. Perhaps in tracking an assassin to the the ninja camps from American Ninja, they encounter Darna along the way. Upon hearing their mission, she not only guides them to the area they describe, but begins pummeling ninjas with the rest of the heroes. Darna is known by some as “The Filipino Wonder Woman” and could easily replace Wonder Woman in the DCU as a strong, female big hitter. You could use Darna to explain away the Golden Age vs. Silver age Wonder Woman continuity glitch. While it would be a slight retcon to place Darna in WWII, it wouldn’t be a far stretch for her character to be in the JSA. Since the Philippines was invaded during WWII, she would probably be involved in some interesting guilt subplots about being with the JSA rather than defending her homeland (I shall return). She’d fit even more easily into a Silver Age or modern Justice League. It’s almost criminal she hasn’t been considered for the JLI. Another alternative is for Narda to study abroad. It’s fairly common for Filipinos to study and/or work in America, particularly those interested in medicine, and Narda is studying to become a doctor. Narda could migrate to LA, San Francisco, Vancouver (Canada) or just about anywhere in North America. Boston could be an interesting possibility while studying medicine at Harvard . Wherever Narda is, Darna is a shout away. Humorous: Darna could be brought into conflict with the Superfriends after discovering the treatment of their Filipino maid, Maritess. Upon hearing Maritess’ story, Darna could seek out the Hall of Justice in order to confront the Superfriends, particularly Superman and Aquaman. Of course, she may take the time to lace her costume with lead first. In contrast to this, Darna has had the help of a mermaid, Dyesebel, in the past. Perhaps this mermaid civilization has encountered Atlantis. If it’s during Arthur’s reign, Darna could be asked to be an ambassador since his connections to surface dwellers is well documented. If it’s during his exile, perhaps the mermaids are at war with Atlantis and see their only chance at peace in helping restore Arthur to his throne. They ask Darna to seek him out on the surface and request his help to bring peace to the underwater civilizations. Mind Blast is Touch and Bashing only, combined with using Hypnosis to remove immediate memories (and must be used when taking memories with Hypnosis) APs of time in the past equal to RAPs. Telepathy and Personality Transfer is seriously marginal and at GMs discretion with anyone other than her host. Hypnosis does not suffer from multi-attack penalties as long as the targets can see Darna’s eyes and hear her singing voice. Use of Hypnosis other than removing memories relies on her voice. I listed some of her powers to her tiara. In the comic, it is said to give her the “protection of The Matriarchs.” However, she only removes the tiara for a brief time and it’s not entirely clear what, if any powers, it actually provides. I speculated based on notes from authors in letter sections. In older versions, these powers are internalized. Language (Tagalog), Attractive, Area Knowledge (Philippines), Iron Nerves, Insta-change, Local Hero (Filipinos). Media (High), General Ramos (High), Police (High), The Matriarchs of the Adarna (High). 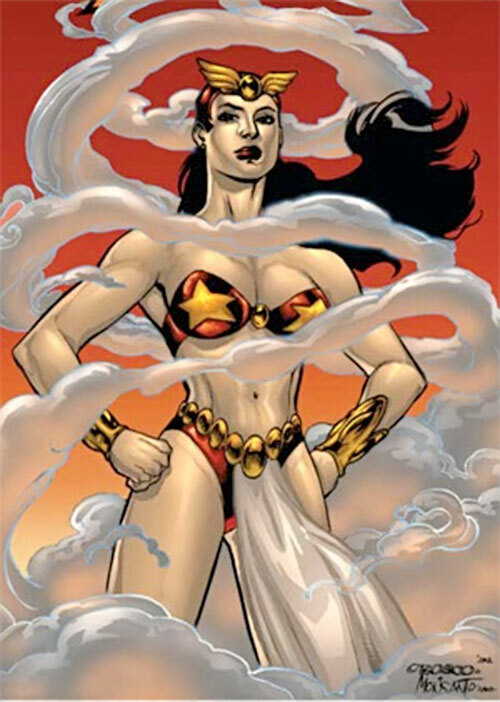 Darna has also been known to adventure with other Philippine based heroes such as Captain Barbell (another Captain Marvel type), Dysebel (a mermaid) and Lastikman (a Plasticman type). She could presumably call upon any of them for aid. Alter Ego (controllable), Dependent (Grandmother), Enemy (Valentina), Voluntary Exile, Limelight, Secret ID. In the different versions of Darna, her equipment varies slightly. While she always has bracelets, a winged tiara (usually part of a red skullcap) sometimes with a ruby in the center, and a belt that seems to be covered with discs. Their use and impact on her abilities (if any) seems to change somewhat, depending on the author. The Golden Tiara of the Adarna Warriors is the symbol of Darna’s people and is a source of her power. It is clear it possesses symbolic significance and in the Mango Comic is said to convery the “protection of the Matriarchs.” According to authors’ notes, it also boosts her psionic abilities. Golden Tiara of the Matriarchs [BODY 30, Invulnerability: 20, Flight: 14, Power Reserve: 08 (to BODY, STR, Telekinesis, Mind Blast, Hypnosis; Power Reserve can only be used up to 4 APs on attributes and defaults to Str and Bod unless declared otherwise)]. The Ruby in her Tiara has the ability to project a powerful concussive blast and is possibly the actual source of her Heat Vision in the GMA series: Tiara Ruby [BODY 12, Mental Blast: 08, Heat Vision: 08 (Heat Vision emits from eyes)]. Cell phone Darna always seems to carry a cell phone where General Ramos can reach her (where she keeps it, I have no idea). In the GMA TV series (and possibly some of the older versions) she can use the discs on her belt as shurikens: Shuriken [BODY 03, EV 02, Range: 02, Grenade drawback, Dart bonus]) [Note: MA EV of 13 can be substituted]. In the Viva Films version, Darna takes a page from Wonder Woman’s playbook and bounces bullets off her bracers. Bracelets [BODY 30] plus Schtick (Precise Blocker (Bracers)). I used Wonder Woman and Captain Marvel as the primary benchmarks for the character. Darna is often compared to Wonder Woman but Captain Marvel seems to be the most direct inspiration for the character. Darna’s power set very closely resembles Captain Marvel (and Superman) from her creation. 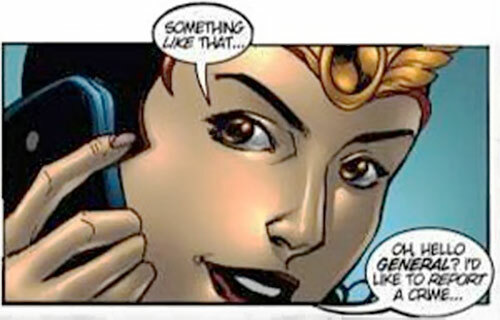 Narda is not only a girl who shouts the name of her adult heroic counterpart to transform (Alter Ego is a common trait amongst Revelo’s characters), but in at least one version, her powers are said to be the “allure of Venus, the glory of Apollo and the strength of Sampson,” which is also very similar to the moniker of SHAZAM. Since there are lots of questions about the higher level characters (such as Superman and Captain Marvel) and Dexterity, it’s important to note Darna routinely takes on trained soldiers (who have enhanced/Enchanted stats, particularly Str) throughout the comic in groups of 5-10 usually without ever being touched (even while actively attacking). This is true even when she does not seem to use Superspeed. In the GMA TV series, she often uses Superspeed more blatantly and catches all the bullets from an automatic rifle being fired at her and/or others (roughly a 14 AP feat). So using Captain Marvel as a benchmark, I went with a slightly lower Dex (more in line with WW) and a higher Superspeed and Martial Artist (to keep her substituted Dex in line with the Captain and Superman). Attractive, Buddy (Ding), Insta-change, Language (Tagalog).